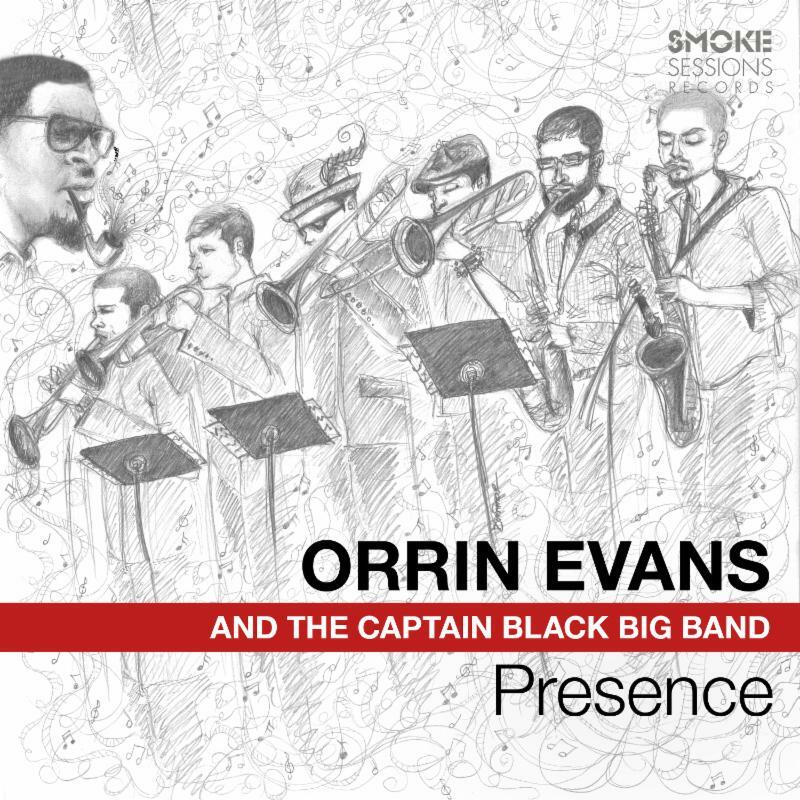 Presence, due out September 21 via Smoke Sessions Records, features a scaled-down 11-piece version of Evans’ long-running big band, recorded live at a pair of venues in his hometown of Philadelphia: Chris’ Jazz Café (where the band made its debut in late 2008) and South Jazz Parlor. The line-up features a core group of collaborators that the pianist tends to refer to as “a family” or “a village” more than a band. 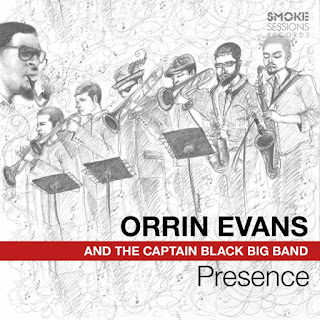 Most of the musicians on this recording have played with Captain Black for years, while many of them have contributed compositions and arrangements to the ensemble’s ever-growing book. That pervasive sense of familial camaraderie shines through the music on Presence, especially in the band’s smaller, tighter incarnation. The band’s downsizing can be explained in part by practical considerations: it makes an easier fit for their long-running stint on the intimate stage of Smoke Jazz & Supper Club, for one. It’s also been easier to manage as Evans’ schedule has become more crowded since joining The Bad Plus in January. But the 11-piece band also represents a distillation of the larger ensemble, pared down to a close-knit core of players that know each other very well, can navigate the music with the spontaneity of a small band, and simply enjoy the experience of sharing the stage together. The Captain Black Big Band’s taut, boisterous energy bursts out of the gate with trombonist David Gibson’s aptly-named “The Scythe.” The tune’s keen-edged theme evokes a ferocious round of soloing from the composer as well as saxophonist Troy Roberts, trumpeter Josh Lawrence and the leader, recently name “Rising Star Pianist” in the 2018 DownBeat Critics’ Poll. Robert’s vigorous tenor leads the way into Eric Revis’ bracing “Question,” originally recorded by Tarbaby, the collective trio that Revis and Evans share with drummer Nasheet Waits. Evans opens John Raymond’s “Onward” with a meditative intro that lends a spiritual overtone to the piece’s sense of inspirational uplift, answered by the composer’s swelling trumpet solo, which soars ever higher as it draws strength from the band’s powerful backing. Evans’ own “When It Comes” finds the band teasing out its raw edges, enjoying a playfully tempestuous give and take. Raymond’s blustery solo rides the avalanche of Anwar Marshall’s roiling rhythms, while Evans adds incisive interjections. Another Evans original, the spring-loaded “Flip the Script” prompts a spirited dialogue between Roberts and alto saxophonist Caleb Curtis. The surging groove of Roberts’ “Trams” is established with an audience participation clap-along, parrying the roaring horn thrusts of the tune. Evans tenderly establishes the mood for his own “The Answer,” while Lawrence’s explosive title track, originally recorded on his own album Color Theory with Evans in the band, ends the set on a characteristically vibrant note. All that’s left is a brief, ramshackle reprise of “When It Comes” that sends listeners off with the band’s rambunctious clamor in their ears.